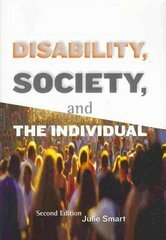 Disability, Society, and the Individual 2 Edition This unique book provides a broad, comprehensive examination of the experience of disability. Its content focuses on definitions of disability, societal response to people with disabilities, and the experience of disability from the perspectives of individuals with a disability and society. It is organized around broad themes as opposed to disability categories. With an engaging writing style and completely updated extensive references, DISABILITY, SOCIETY, and the Individual prepares the reader to understand and be able to use complex, important, and new ideas surrounding disability - its experience and its social and cultural context. The text includes discussion questions, learning activities, suggested readings, and first-person accounts.